New Jersey Search and Rescue maintains a high standard for patient care. 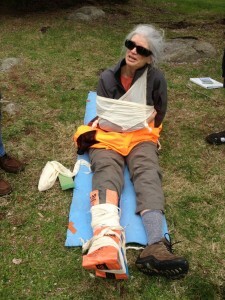 Every member takes at least 16 hours of wilderness first aid training, plus CPR for the Healthcare Provider, AED, patient assessment and bloodborne pathogens training. Our Medical Unit includes numerous medical professionals and every member is trained to assess, stabilize, package and transport subjects. They take vitals and relay the patient’s status to command while colleagues plan an evacuation route. One task member is always with the patient, updating them on the evacuation plan and what’s happening next. 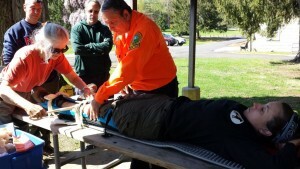 NJSAR’s Medical and Mountain Rescue Units collaborate to evacuate patients in high-angle environments. In an effort to reinforce empathetic and conscientious patient care, every member performs a mandatory stint as a volunteer patient for a training exercise, which includes being assessed, treated, packaged and evacuated in a Stokes basket. Elaborate mock searches and medical scenarios incorporate state-of-the-art equipment and techniques for patient care. For more information on joining the New Jersey Search and Rescue Medical unit, please Contact Us.